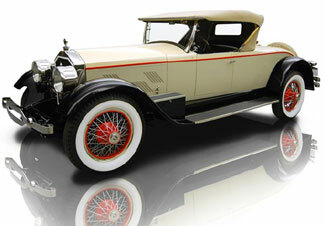 This incredibly rare 1928 Stearns-Knight F6-85 2/4-Passenger Roadster was the subject of a no-expense-spared frame-off restoration by noted Stearns-Knight expert Arthur Aseltine and has won an Antique Automobile Club of America Senior Division National 1st Place Prize, a 100-point award from the Classic Car Club of America and 2nd in Class at the prestigious Pebble Beach Concours. According to the Willys Overland Knight/Stearns-Knight Registry, just 519 six-cylinder Stearns-Knight automobiles were built that year, while a total of just over a hundred Stearns-built cars exist today. This car may in fact be one-of-one; of the tiny handful of 1928 Stearns-Knight automobiles that have survived, how many are highly desirable 2/4-Passenger Sport Roadsters? Originally painted black with a red belt molding, the car was restored in its current authentic Stearns-Knight colors of beige over gray with a red beltline and traditional black fenders and aprons, giving the car a striking and elegant appearance. The interior of both the cockpit and 2-passenger rumble seat are finished in fine grain leather, with a perfectly-fitted and wrinkle-free tan Haartz canvas top that folds neatly into a depressed well behind the front seat. Weather protection is provided by removable side curtains. All exterior trim is highly polished nickel, not chrome, along with the lovely strip of polished aluminum along the tops of the doors and dashboard. The single-piece windshield swings out at the bottom and is framed in German silver, just like Rolls-Royce grilles of the same vintage. The engine in this car is a fully rebuilt Model D double-sleeve valve six cylinder Knight engine displacing 288.6 cubic inches and conservatively rated at 85 horsepower. It features a 7-main-bearing crankshaft, pressure lubrication, and the unique Knight sleeve-valves, providing overall endurance and reliability far beyond conventional engines of the vintage. In addition to increased efficiency and power, the Knight engines were also famous for their near-silent operation (hence the "silent Knight" nickname), and this car is no exception. The entire engine compartment is detailed to an exceptionally high standard and all equipment is fully functional.